Larry Tucker, left, appeared in court with his attorney, Kirk Allen McVay, right. Photo by Carrie Gloeckner. 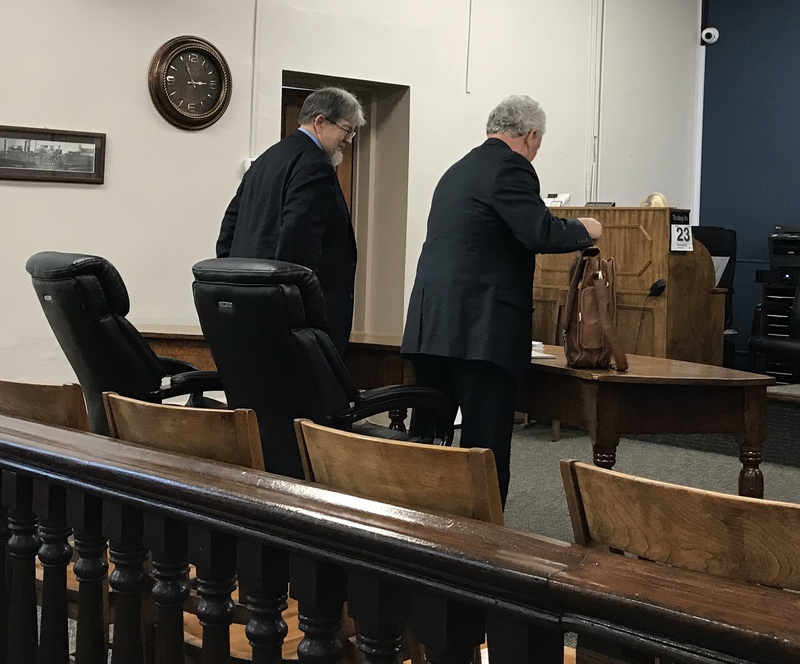 POMEROY, Ohio – Larry Tucker was arraigned on additional charges in the Meigs County Court of Common Pleas on January 23, 2019. Tucker faces additional charges, filed separately from a pending case. The new charges include Kidnapping, Attempted Sexual Battery and Gross Sexual Imposition. Tucker had been indicted on four charges in a new case involving a twelfth alleged victim on January 9. Tucker had previously been charged, arraigned and awaiting trial for 28 counts with 27 being felony charges along with one misdemeanor. Tucker was charged with the following: six counts of Kidnapping, all felonies of the first degree; six counts of Sexual Battery, all felonies of the third degree; five counts of Gross Sexual Imposition, all felonies of the fourth degree; five counts of Attempted Sexual Battery, all felonies of the fourth degree; four counts of Attempted Compelling Prostitution, all felonies of the fourth degree; one count of Theft in Office, a felony of the fifth degree; and one count of Soliciting, a misdemeanor of the third degree. Tucker had previously entered a not guilty plea to each count. The additional case was filed separately, but during the arraignment hearing Special Prosecuting Attorney Angela R. Canepa filed paperwork for the court to merge the previous case and the new one together. Judge Linton D. Lewis, Jr., said he would take it under advisement. Tucker appeared with his attorney, Kirk Allen McVay. With the additional four counts Tucker has been indicted on, he entered a not guilty plea to each count. He was indicted with four new charges: one count of Gross Sexual Imposition, a felony of the fourth degree; two counts of Kidnapping, a felony of the first degree and both carrying two specifications; and one count of Attempted Sexual Battery, a felony of the fourth degree. The two counts of Kidnapping included specifications from the Grand Jury stating. “The Grand Jurors further find and specify that Larry D. Tucker did commit Kidnapping with a sexual motivation” on the first specification and “The Grand Jurors further find and specify that Larry D. Tucker is a sexually violent predator.” Similar specifications were some of the original charges as well. According to the latest indictment, the alleged incidents took place between January 1, 2012 and October 13, 2013. As in the previous case, the new charges stem from time that Tucker was serving as a corrections officer with the Middleport Jail and as a probation officer with the Meigs County Court of Common Pleas. Tucker was released on an Own Recognizance Bond with the restriction of not to have any contact with the victims or witnesses in the case. Previously he had posted a $200,000 bond. McVay argued that the two cases would be merging together and the state agreed to the OR bond with the restriction concerning alleged victims or witnesses. McVay was also named court appointed counsel. Currently there is a jury trial scheduled for the previous indictments on March 6, 2019. In the matter of the original case, a motion to suppress an alleged confession concerning one of the alleged victims has been granted. When the case goes to jury trial, the alleged confession will not be among the evidence jurors may consider following a ruling by Judge Lewis. The motion to suppress was filed on October 11, 2018 followed by a hearing on the matter October 29, 2018. It was not until December 26, 2018 that Judge Lewis filed his ruling on the motion to suppress. According to court documents, on November 15, 2017 Tucker was interviewed by Special Agent Jenkins from the Ohio Attorney General’s Office, Bureau of Criminal Investigation. The interview took place in the Meigs County Sheriff’s Office and lasted about an hour and a half. The judge further addressed that several times Tucker questioned having an attorney with him. Tucker mentioned it several times, however, he was not permitted to make a phone call to an attorney. “As to the voluntariness of Defendant’s statements, the burden is on the prosecution to show that, considering the totality of the circumstances, the statement was voluntarily given,” Judge Lewis wrote in his ruling. He further found that the statement was “involuntarily given” and the recorded statement was suppressed.